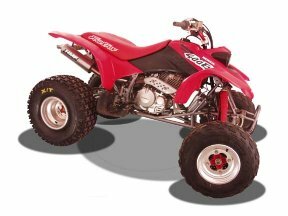 Honda`s TRX-400EX has panned out to be the four stroke sport ATV to have but it NEEDS MORE power! That’s where HMF comes in with our new slip-on muffler for the TRX-400EX. Free flowing, and significantly lighter than the stock muffler, the HMF slip-on dramatically improves the power to weight ratio. The inlet and outlets are made from 304 stainless steel to look great, be strong, and light. The 6061 T6 aluminum body is available in 3 finishes - brushed aluminum, or anodized black or red for the factory racer look. We of course use Silent Sport brand packing for long life and the best sound damping. Since this muffler flows so well we HIGHLY recommend the Dynojet brand jet kit and K&N air filter to maximize performance. The Yamaha 660R Raptor is not like any ATV. This impressive machine deserves the best, leaving only one logical choice when selecting a performance slip-on or full exhaust system. 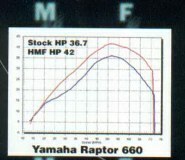 At HMF we pride ourselves in providing the most horsepower available. Dyno tested on our DynoJet quad dyno, the slip-on and full system bring loads of additional power across the entire powerband. With a torque and horsepower advantage you can feel, HMF products are designed to enhance your overall riding experience. 1) Stainless Steel 3 stage head pipe. We use stainless steel because of its corrosion resistance, overall strength, and long lasting good looks. The three stage design allows the exhaust gases to expand as they pass through the pipe extracting maximum horsepower and torque. We also use a handmade merge collector to join the two head pipes for the smoothest flow, and of course, most power. 2) 6061 T6 aluminum muffler body with stainless steel inlet and outlet caps. We also use Silent Sport brand muffler packing, which is quieter and far longer lasting than the industry standard fiberglass.